Simply put, rhinoplasty is Dr. Shah's favorite procedure and Dr. Shah is considered to be a top rhinoplasty surgeon in Colorado. A cosmetic rhinoplasty is a nose surgery procedure which is usually performed purely for cosmetic reasons. In essence, it is a procedure that reshapes the nose to enhance its appearance. Functional rhinoplasty is nasal surgery performed to improve the breathing function of the nose. Reconstructive rhinoplasty is performed to correct nasal deformity secondary to nasal trauma or cancer removal procedures. As such there are many reasons a person may choose to undergo a rhinoplasty in Denver, CO. Some of the issues that people use cosmetic rhinoplasty surgery to resolve are to change the shape of the tip of the nose, to improve the nasal profile by removing bumps or indentations, to change the angle of the nose as it relates to the mouth, to change the shape or size of the nostrils, reduce and reshape a large nasal tip, and to create a nose that visually harmonizes with the face. A rhinoplasty procedure is most ideal for patients who’ve completed their mid facial growth period, generally considered to be after 14 years of age in girls and 17 years of age in boys. Patients should be in good health and should only be considering rhinoplasty for their own personal benefit and not to please anyone else. Patients should also have realistic goals and expectations because rhinoplasty surgery creates permanent change. Rhinoplasty procedures can affect a great deal of improvement in a nose, but it is generally not recommended to try to change the nose drastically. Consulting with a skilled board-certified plastic surgeon who specializes in rhinoplasty surgery procedures, such as Dr. Manish H. Shah, is the best way to determine if your goals are achievable. Denver rhinoplasty Specialist Dr. Shah is considered one of the best rhinoplasty surgeons in the country. Patients from Denver, the surrounding region, nationally and internationally consult with him because of his skill and his demeanor. 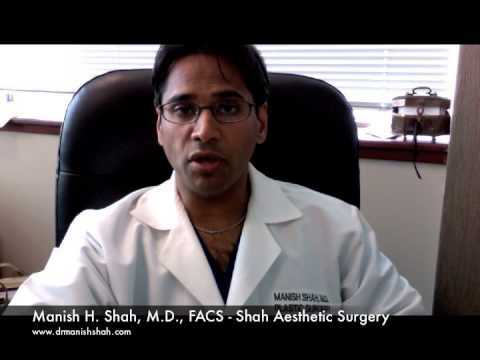 "Excellent Nose Surgeon Dr. Shah operated on my nose recently. He literally built my nose, or half of it depending on how you see it, due to the underdeveloped mid-section of my face. I had consulted three surgeons, including Dr. Shah, for my procedure. Unlike other HCPs that provided brief, standard, and diplomatic answers (mostly by the assistants), Dr. Shah had his individualized approach by offering specific information on my situation. When it came to the final outcome, ONLY Dr. Shah had the assurance of high success rate with Autograft. And he DID it beautifully with great precision. His charge is VERY competitive. From my own experience, Dr. Shah makes good effort in understanding and accommodating his client?s needs. He is genuine and has a great sense of humor." 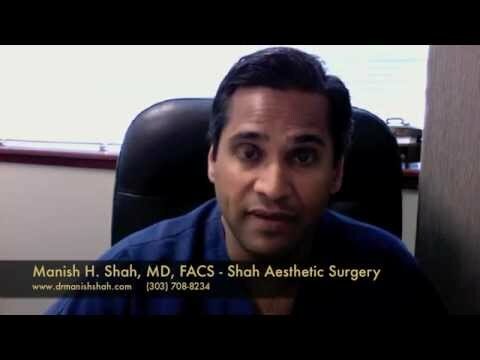 "Excellent Nose Surgeon - Dr. Shah operated on my nose recently. He literally built my nose, or half of it depending on how you see it, due to the underdeveloped mid-section of my face. I had consulted three surgeons, including Dr. Shah, for my procedure. Unlike other HCPs that provided brief, standard, and diplomatic answers (mostly by the assistants), Dr. Shah had his individualized approach by offering specific information on my situation. When it came to the final outcome, ONLY Dr. Shah had the assurance of high success rate with Autograft. And he DID it beautifully with great precision.His charge is VERY competitive.From my own experience, Dr. Shah makes good effort in understanding and accommodating his clients needs. He is genuine and has a great sense of humor._______________________,,"
"I was so extremely lucky to find Dr. Shah who was able to reconstruct my nose after four rhinoplasty surgeries with other doctors in Denver that were performed incorrectly. One of these doctors is even well known in town for working with?" "very positive experience! - Dr.Shah and his staff were very kind and professional. I wanted some very specific and subtle things done to my nose. Dr. Shah had no problem understanding my needs and had a few helpful ideas of his own. My nose looks great and very natural!" "New and improved - I had always known I would pursue rhinoplasty eventually, but actually taking the leap was not an easy choice. I couldn't be happier with my results from Dr. Shah. He listened to what I wanted and I now look like an improved version of myself. He addressed all of my concerns and although I've noticed a huge difference in my look, my friends and co-workers didn't even know I had the procedure! I'm absolutely thrilled!" Your rhinoplasty consultation with Dr. Manish Shah will allow for a physical examination of your nose after discussing your relevant pre-history. Dr. Shah will then typically take multiple pictures of your nose from various angles to assess the anatomy of the nose for rhinoplasty surgery. He then takes these digital photos and puts them into rhinoplasty simulation software. With this software he can simulate various changes to your nose to give you an approximate idea about your possible outcomes. It is important to note that rhinoplasty simulations are not a guarantee or warranty of any particular outcome. Dr. Shah uses the simulations to help educate you, the patient, about what is possible and what is not possible. Complications from rhinoplasty surgery are quite rare but they can include the following: bleeding, infection, scarring, wound healing problems, asymmetry, numbness, soft tissue loss, breathing problems, septal perforation, dorsal saddle nose deformity, stiffness, need for revision surgery, dissatisfaction with the cosmetic outcome, reactions to medications and anesthesia, heart problems, lung problems, brain problems, and death. While this might sound scary, rest assured that you are in the best hands with Dr. Shah! As a specialist in rhinoplasty surgery in Denver, Dr. Shah will make sure that you are well educated and prepared for a successful rhinoplasty procedure. With an open rhinoplasty, the incisions are made on the tissue between the nostrils or on the natural crease of the nose just above the lips. This allows for greater access and view of the confines of the nose. As rhinoplasty is a complicated procedure, many surgeons prefer this approach as it is easier to manipulate the bones and cartilage. The skin of the nasal tip and bridge are gently lifted up to reveal the internal structures of the nose and redraped once reshaping is completed. The scars associated with this approach are tiny - less than 5mm - so they are not easily noticeable once fully healed. During a closed rhinoplasty surgery, incisions are made to the inside of the nose through the nostrils. This is a common technique for patients who desire mild reshaping. This approach does not cause visible scarring. For severe reshaping cases, the open rhinoplasty technique will be implemented. Dr. Shah has significant experience using both open and closed rhinoplasty techniques so he will be able to determine the approach for your individual case. A nonsurgical rhinoplasty is often used to hide mild irregularities on the nose, elevate the bridge, revise a previous rhinoplasty, and camouflage a nasal hump. For minor reshaping, some patients can opt to try an injectable filler to achieve results. These come in a variety of liquid substances, and sometimes a fat transfer can also be utilized. A filler can help add volume to hide small deformities, such as a bump or a bony appearance. It is important to note that fillers can only do so much in the reshaping process. For most patients, surgery is a better option and will offer a permanent solution. Dr. Shah loves to use Restylane and Radiesse as his most common fillers for nonsurgical rhinoplasty. Tip rhinoplasty is a very common procedure in Dr. Shah's rhinoplasty practice. The tip of the nose can vary greatly from one person to the next. A nasal tip that doesn’t blend into the rest of the nose or the rest of the face can cause visual disharmony. In this day and age of the “selfie,” this disharmony can make your photos unappealing. Nasal tips can be rather bulbous, squarish, round, downward pointing, upturned, pointy, indistinct, shifted to one side and/or elongated. A tip rhinoplasty changes the appearance of the tip of the nose by either adding, reshaping, or removing some of the cartilage of the lower lateral cartilages. Tip rhinoplasty can be performed as part of primary rhinoplasty, but it is often performed just by itself when a patient is comfortable with the upper half of the nose. It is primarily considered a cosmetic operation, but when a previous rhinoplasty turns out subpar, tip rhinoplasty is often necessary to rebuild a poorly supported and functioning tip structure. The physical makeup of the tip itself varies by gender and ethnicity. With ever blending populations, people often come into my office with exotic looking noses that are a blend of their varying ethnicities. Cultural leanings also affect what people might want their nasal tip to look like. Tip rhinoplasty is performed by manipulating the existing cartilage structures. Cartilage grafting from other sources like the septum, ear (concha), or rib may also be necessary to support and define the tip and the nasal valves (internal and external). Tip rhinoplasty may be performed through either the open approach or the closed approach. The open approach, which uses an incision on the skin of the columella (fleshy divider of the nostrils), is typically considered the most accurate method for working difficult tip issues. A functional rhinoplasty is a nose surgery designed to improve the function of the nose (i.e. the ability to breathe easily) without significant changes to the appearance of the nose. In most cases, however, many patients need a combination of both functional and rrimary rhinoplasty. After all, often times the issues are related. Some signs that you may be suffering from an inadequate, obstructed nasal airway include: breathing with your mouth open, having a difficult time smelling scents, and nasal congestion. If left untreated these symptoms could develop into more serious issue such as: nosebleeds, obstructive sleep apnea, hypertension, sinus pressure headaches, reoccurring sinus infections, and even heart disease. There are internal and external functional rhinoplasty procedures. External rhinoplasty procedures would be used to improve a nose that is collapsed, pinched, deviated or twisted. In these situations, the general framework of the nose is unsupported or distorted. Septoplasty – This is a procedure to correct a deviated septum. A deviated septum is defined by the bending, twisting, or deviation of the cartilage wall which divides the left and right nasal passages so that one or both are blocked. Septoplasty surgically straightens this wall creating much easier air flow. Turbinate Reduction – The turbinates are mucous membrane-covered sections of bone which line the entire length of the nasal cavity. There are three sections: superior turbinate, middle turbinate and the last, and most likely to develop enlargement issues which contribute to airway blockage, is the inferior turbinate. A partial reduction of some to the turbinate tissue is all that is required to unlock the air flow. Nasal Polyp Removal- Nasal polyps are small, round growths that are benign and can block the nasal passage. These can be entirely removed surgically. They do need to be evaluated by a pathologist as they could contain a malignancy. Nasal Valve Collapse- The nasal valve is the narrowest part of the nose’s airway and it’s lined with membrane that are designed to shrink and swell as they regulate air flow. In very thin noses or in noses which have experienced trauma or disease, the nasal valve may actually collapse. Patients with short nasal bones will need middle vault support procedures to correct nasal valve collapse during rhinoplasty surgery. Rhinoplasty procedures are typically performed in fully-accredited outpatient surgery centers. Dr. Manish Shah uses board-certified anesthesiologists with an M.D. Dr. Manish Shah prefers to use full general anesthesia because he believes it allows for better control of the patient’s airway. This maximizes safety. No one, but Dr. Shah, touches the patient during rhinoplasty. Dr. Shah, though he loves to teach, is the only person who will be operating on your nose. Dr. Shah’s patients typically experience very little bleeding or post-operative bruising. Postoperative nausea and vomiting after rhinoplasty are also fairly rare. Pain control is fairly easily established, and most patients stop their narcotics by their second post-operative day. A patient will rarely wake up with nasal packing. If extensive work is done to straighten a deviated nose, Dr. Shah will often leave temporary internal splints to help mold the airway and insure that breathing will ultimately be improved after the surgery. All patients have an external molding splint left on for at least 7 days after surgery. This helps stabilize the skin and keep any surgically fractured nasal bones in place. The first week is typically the hardest week for the patient. They will be sleeping with their head elevated. They will be applying ice packs to reduce bruising and swelling. They are not allowed to get their faces wet, so hair washing is a bit difficult to do. Dr. Manish Shah recommends bathing during this first week. A cool mist humidifier at the bedside is very soothing for the face and throat after rhinoplasty. After this week, you will typically have your external splint and any external sutures removed. At this point, you will be taught the second phase of your care. You will be allowed to rinse out your nose with saline spray and use oral decongestants to unclog your airways. You will be taught night-time taping techniques and soft tissue massage to help mold your nose. You will not be able to use eyeglasses, sunglasses, or ski goggles for 2 months to avoid shifting fractured nasal bones. Your nose may swell after the splint is removed, but with time it will decongest. The upper part of the nose settles in after about 3 months. The bones are at their hardest at this point. For the next 5 - 6 months after this, most patients don’t notice big changes. Finally, around 10 - 12 months after surgery, the tip of the nose finalizes its cosmetic outcome. Patients must realize that patience is mandatory because it will be at least 1 year before they see how their rhinoplasty surgery turned out. This blog gives you all the information you might want about the most difficult procedure in cosmetic surgery, written by Manish H. Shah, MD, FACS, a specialist in rhinoplasty, revision rhinoplasty, and ethnic rhinoplasty surgery located in Denver, Colorado. As a board-certified plastic surgeon with a specialty in facial plastic surgery, Dr. Shah has undergone rigorous training at some of the best institutions in the country. Dr. Shah's plastic surgery training at the University of Tennessee provided him with facial trauma training at the 99th percentile of all programs in the country. Dr. Shah's fellowship in aesthetic surgery at the Manhattan Eye, Ear, and Throat Hospital (MEETH) in New York City included significant amounts of rhinoplasty surgery and is considered the most prestigious in the country. Dr. Shah's rhinoplasty training at MEETH was with some of the biggest names in nose surgery. When Dr. Shah first moved to Denver, he took over as Chief of Plastic Surgery at Denver Health (associated with the University of Colorado School of Medicine), one of the country’s busiest Level 1 trauma centers where he took care of a tremendous amount of facial trauma and facial reconstruction. Reconstructive rhinoplasty was a big part of his academic practice. Dr. Shah continues to maintain his training in rhinoplasty by advancing his education on a yearly basis. Dr. Shah was recently inducted, as the youngest Active member, into the Rhinoplasty Society, a group of surgeons from around the world dedicated to performing rhinoplasty at the highest levels. 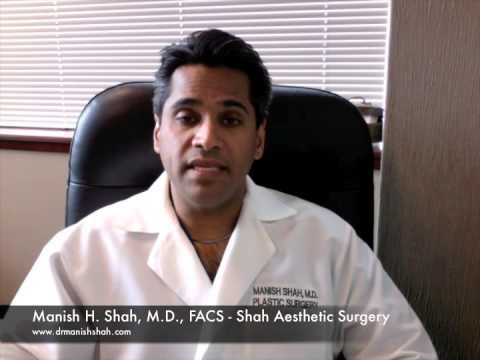 90% percent of Dr. Shah's surgical practice is related to cosmetic surgery of the face, eyes, ears, and nose. Dr. Shah performs, on average, around 1000 facial surgical procedures per year. According to 2010 statistics from the American Society of Aesthetic Plastic Surgeons (ASAPS), member surgeons averaged 6 rhinoplasties per year. Dr. Shah performs, on average, around 50 rhinoplasties per year. This number continues to increase every year. Dr. Shah does perform non-surgical rhinoplasty. The technique of nonsurgical rhinoplasty is becoming popular for those not yet ready for surgery. This technique uses the injection of filler material (e.g. hyaluronic acid, Radiesse) or fat to fill in areas of the nose to balance out the bridge of the nose. It can also be used to fix post-surgical deformities of the nose. BOTOX is also used to reduce animation of the muscles around the nose and even raise the tip of the nose. It is important to remember that non-surgical rhinoplasty tends to increase the size of the nose. Also, the procedures have to be re-performed over time, as fillers and BOTOX are not permanent. Most rhinoplasty surgery is performed for cosmetic reasons. To this end, it is not covered by health insurance. Some patients have breathing restrictions that are due to problems such as a deviated septum, hypertrophy of the turbinates, or internal nasal valve collapse secondary to middle vault narrowing. Health insurance will occasionally cover the contracted amount for the repair of these problems during rhinoplasty. It is important to note that we will bill a patient separately for the cosmetic and insurance portions of the rhinoplasty surgery. Both parts of the operation are timed separately. The patient needs to know that they will have separate out-of-pocket charges for Dr. Shah’s fee (cosmetic), the anesthesia time (cosmetic), and the facility charge (cosmetic). These are due in full prior to surgery. The insurance portion of the rhinoplasty procedure is billed separately after surgery, with a remainder billed to the patient after co-pays and deductibles are met. Rhinoplasty is the most difficult cosmetic procedure to perform. Because of the nose's central position on the face, it is in view at all times. This allows patients to focus on any perceived deformity to excess. Dr. Shah believes that it is important to create a nose that fits the other features of a person’s face. Often times the nose that has been bothering a patient, is only troublesome because it is out of place with the rest of the face. A well-performed rhinoplasty blends a nose in to its surroundings. This creates the best nose for a patient. Dr. Shah takes time to listen carefully to a patient so that he can really understand what bothers them and better understand what motivated them to seek out rhinoplasty surgery. Dr. Shah also performs rhinoplasty simulations to help get a better understanding of a patient’s cosmetic surgical goals for their nose. Dr. Shah stresses that simulations are not a guarantee or a warranty of any particular outcome, but that they are a better way to understand the needs of the patient. Revision rates for rhinoplasty surgery nationally run 30-50%, but because of careful and exacting preoperative and intraoperative management of each patient, his revision rate for all patient is under 10%.